This is Lola the Cockapoo, my first commission of 2015! 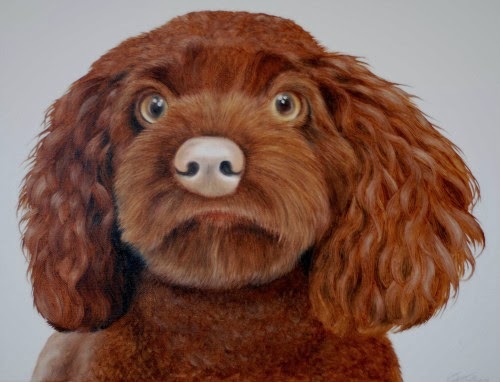 I've only just been able to post about this lovely pooch as the painting was a surprise birthday present for Lola's Dad. As most people probably know a Cockapoo is a cross between a Cocker Spaniel and a Poodle, I've read that their temperament is Outgoing, Active, Intelligent and Loving and from what I've heard about Lola that sounds spot on! After seeing me at the Dorset Gallery Christmas show in Wareham Lola's mum Michele got in touch after Christmas to see if I could paint Lola in time for her husbands Birthday, as soon as I saw a photo I couldn't wait to get started! "Mark loved his present! Thank you for all your hard work getting the surprise ready for today." It's always great to hear about peoples reactions especially when its a surprise present, Michele is hoping to get a photo of Lola with her portrait (although I know this can be difficult unless you have plenty of treats on hand!) so I'll update the blog if I do get one.